Let’s first have a look at the bonds with the highest quality within the Eurozone, i.e. 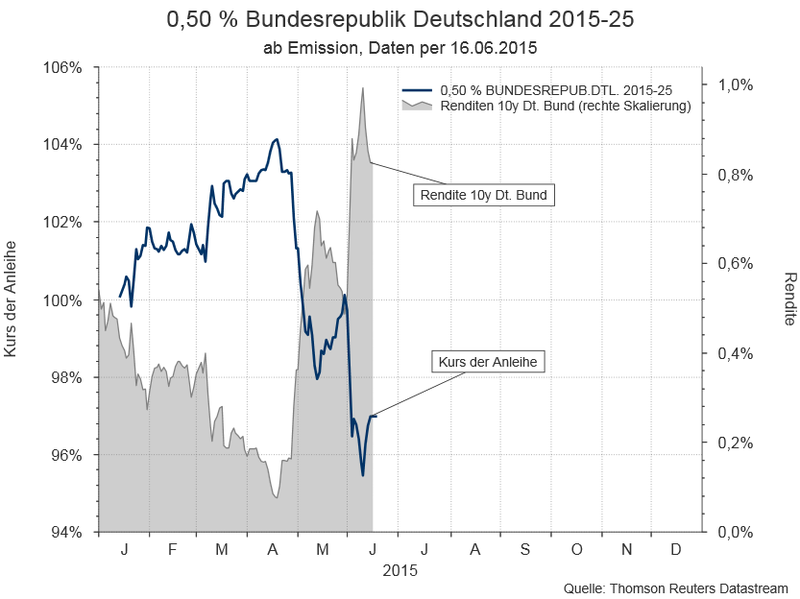 German government bonds. Where have the prices of these bonds gone most recently? In our example, we have chosen a 10Y German government bond. Please note: Past performance is not indicative of future development. Price charted from issue. The performance of time series of less than twelve months in particular is of low explicative value due to the short duration. The chart does not allow for fees. The chart shows that bonds have incurred significant losses from April onwards (blue line, right scale). By contrast, the securities yield increased significantly (grey area, right scale). But the decline in prices was not limited to this specific bond. All across the Eurozone government bond prices were down. This was independent of issuer and maturity. Bonds with longer maturities took a considerably harder blow than bonds with shorter maturities. How do bond price losses affect bond funds? The performance of the bond fund depends directly on the bonds contained in the portfolio. Please note: performance calculated according to the OeKB method. The performance accounts for the management fee. The chart does not allow for a one-time load of up to 3.50% (depending on the fund) nor any other fees reducing return such as individual account or depositary fees. Past performance is not indicative of future fund performance. On the basis of a 5Y horizon, the fund containing the government bonds, ESPA BOND EURO-MÜNDELRENT, (green dotted line) is roughly in line with the fund that offers a broad mix (ESPA SELECT BOND, blue line). But given that the maturity of ESPA BOND EURO-MÜNDELRENT is on average longer and the focus is on one bond class, this return was achieved on the back of higher volatility. The fund with the high-yield bonds (ESPA BOND EUROPE-HIGH YIELD, grey line) differs vastly in terms of price performance, as particularly well displayed for example in 2011. Here, the fund incurred a clear decline – by contrast, the fund containing government bonds (ESPA BOND EURO-MÜNDELRENT) recorded significant gains. At first, the German government bond with longer maturity. Please bear in mind: the bond lost about 8 percentage points from its high in April to its low in June. The following chart shows the effects of this market correction on the selected funds. Please note: performance calculated according to the OeKB method. The performance accounts for the management fee. The chart does not allow for a one-time load of up to 3.50% (depending on the fund) nor any other fees reducing return such as individual account or depositary fees. Past performance is not indicative of future fund performance. The performance of time series of less than twelve months in particular is of low explicative value due to the short duration. The chart highlights the fact that funds with different strategies were also affected to a different degree by these developments. 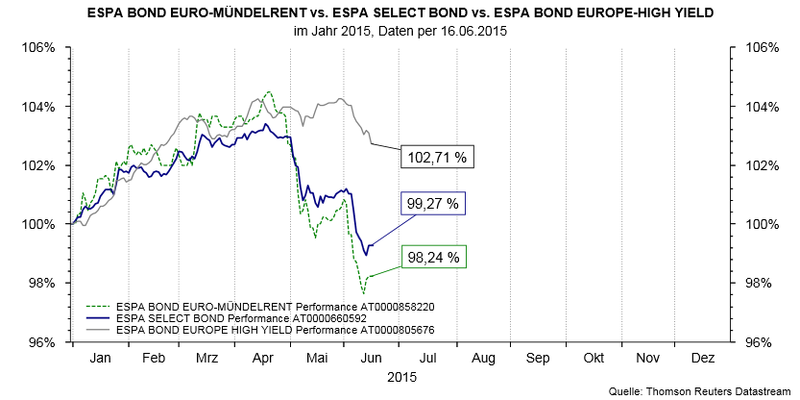 As expected, the fund with the focus on government bonds took the biggest hit (ESPA BOND MÜNDELRENT). The fund with the highest risk (as assessed on the basis of the rating of the bonds in the portfolio) recorded the lowest losses (ESPA BOND EUROPE HIGH YIELD). The asset class least affected by the corrections within the bond market were corporate bonds, where the performance in the year to date is still clearly positive. 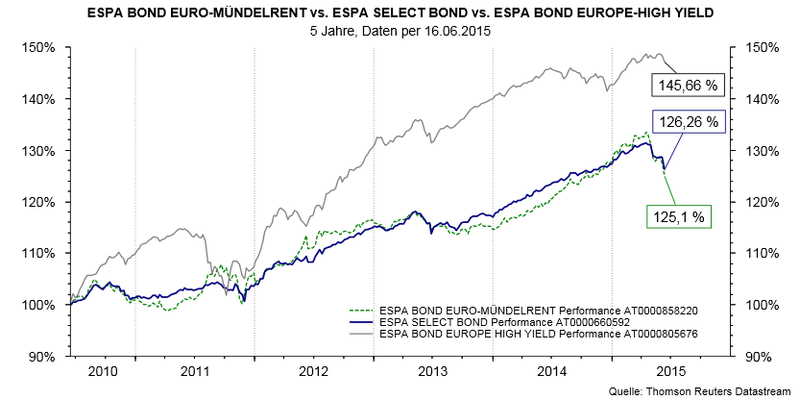 ESPA SELECT BOND, with its broad mix of different bond asset classes, ended up around the middle. There are big differences when it comes to investing in bonds. Depending on the maturity of the bond or the quality of the bond issuer, bonds record different performances in different market phases. The market movement from April 2015 onwards came as a surprise and was of considerable force. We expect such significant fluctuations to come about more frequently in the future. However, we cannot predict when and what bond class will be affected to what degree. What opportunities can investment funds offer you in this context? Please bear in mind that not every bond fund invests in the same markets or market segments. Different funds will cover the individual needs of different investors. Can I still invest in bond funds, and if so, what fund should I choose? It is not possible to recommend one single fund to all investors, since every investor has their own individual priorities and risk appetite when it comes to their assets. Bonds and bond funds are a crucial element in every client portfolio regardless of the prevalent interest rate environment. But do not put all your eggs into one basket. Diversification across different assets is currently of utmost importance. Also, given the low interest rates, it may be a good idea to take also a look at the equity markets. For details on the aforementioned funds, an explanation of the benefits and risks if investing, and all relevant legal documents, please visit the homepage of Erste Asset Management at www.erste-am.at. ESPA BOND EURO-MÜNDELRENT intends to invest more than 35% of assets under management in securities and/or money market instruments of public issuers according to the Austrian Financial Market Authority. For a detailed listing, please refer to the prospectus, section II, sub-section 12. ESPA SELECT BOND may invest significant parts of its assets under management in investment funds (UCITS, UCI) according to sect 71 of the Austrian Investment Fund Act of 2011. Johann Griener has worked at Erste Asset Management in Sales Retail since 1 January 2001. In this function he supported for example the Sparkasse banks in Austria, with a current focus on Upper Austria. His scope of duties includes the servicing, training, training and education of Sparkasse employees who work in the securities field. This means creating and holding presentations in the local branches and in Erste Asset Management for the purpose of promoting sales of ERSTE-SPARINVEST, Ringturm, and Erste Immobilien KAG funds. He also supports the Sparkasse banks (Austria-wide) in their own investments (nostro business). In addition, Griener is developing numerous publications for internal and external use. The “1x1 of Investment Funds” that he wrote is found in all of the branch offices of Erste Bank and the Sparkasse banks as basic reading and an introduction for customers on how investment funds work. Griener began his career in 1988 as an employee at the bank counter in a local Sparkasse bank. There he learned the banking business, from a savings book to loans to investment operations. After a few years at the Sparkasse, he decided to continue his studies at the Vienna University of Economics and Business, with a focus on “banks” and “securities”. After completing his master’s degree, he remained loyal to the Sparkasse sector and has been working at Erste Asset Management since.